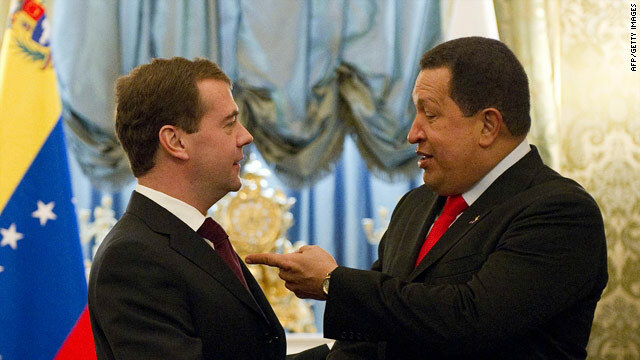 Russian President Dmitry Medvedev meets his Venezuelan counterpart Hugo Chavez in Moscow, October 15, 2010. Medvedev says "our intentions are absolutely pure and open"
Moscow, Russia (CNN) -- Russia and Venezuela signed an agreement Friday calling for Russia to build a nuclear power station in the South American nation. Russian President Dmitry Medvedev and Venezuelan President Hugo Chavez formally signed the deal here after reaching an agreement in April. It's the latest example of increasingly close cooperation between the two nations on matters of energy, trade and defense -- a relationship that has raised eyebrows in the United States. "I don't know who might wince from this news," Medvedev said at a news conference. "The president (Chavez) said that there are countries which may have different feelings about it. But I'd like to say that our intentions are absolutely pure and open." Venezuela is on the path toward developing nuclear, solar and wind energy, which are trends "of high interest to the entire world," Chavez said, according to the state-run Venezuelan News Agency. Medvedev said Russia sees atomic energy cooperation as one of its international priorities and that it builds nuclear power stations around the world. In addition to helping Venezuela build the nuclear power station, Russia will build a research reactor to produce isotopes for peaceful industries and medicine, according to the text of the agreement. Russia and Venezuela have increased their cooperation on a number of fronts in recent years. Last year, Russia approved $2.2 billion in credit to Venezuela to finance the purchase of 92 Soviet-era T-72 tanks and short-range missiles; Venezuela also planned to buy an anti-aircraft weapons system with a range of 185 miles (300 km). Chavez defended the arms purchase. "We are not going to attack anyone," Chaves said then. "Those are only defense instruments because we are going to defend the nation from any threat, from wherever it comes." Yet the deal raised concerns in the United States, where a State Department spokesman said that Venezuela's desire to increase its arsenal poses a "serious challenge to stability in the Western Hemisphere." This year, however, State Department spokesman Philip Crowley said Venezuela's ambition to increase its arsenal, while suspicious, is an issue "between Venezuela and Russia." "We don't care. ... Our primary concern is not if Venezuela wants to acquire ... this equipment," he said. "Our primary concern is that if Venezuela is going to increase its military hardware, we certainly don't want to see this hardware migrate into other parts of the hemisphere." Chavez also met last year with Medvedev and Putin to negotiate and sign new oil and gas contracts between their countries. And in September 2009, Chavez announced while in Russia that Venezuela would recognize as independent republics the regions of Abkhazia and South Ossetia, becoming just the third country, after Russia and Nicaragua, to do so. Russia generally has backed independence for the two regions. Nearby Georgia, which fought a war with Russia in 2008, opposes independence for the two regions.